— BugsInTheNews is a viewer-participant website. This article by Jerry Cates and Keith Stewart, first published on 8 August 2010, was last revised on 6 July 2012. © Bugsinthenews Vol. 11:08(03). I have found two different spiders in my shower and both look almost like the Johnson Jumper except both of these have two dark green stripes running longways down the back. I killed the first one but have the second one in a jar at the House, and will get a picture of it and send it to you tomorrow. I live in North Zulch, Texas, which is about 20 min East of Bryan/College Station. Although this posting initially indicated that this spider was a McCook’s jumper, that identification was in error. The genus Phidippus is complex and certain outward markings, used to distinguish between the species, have been in dispute for years. 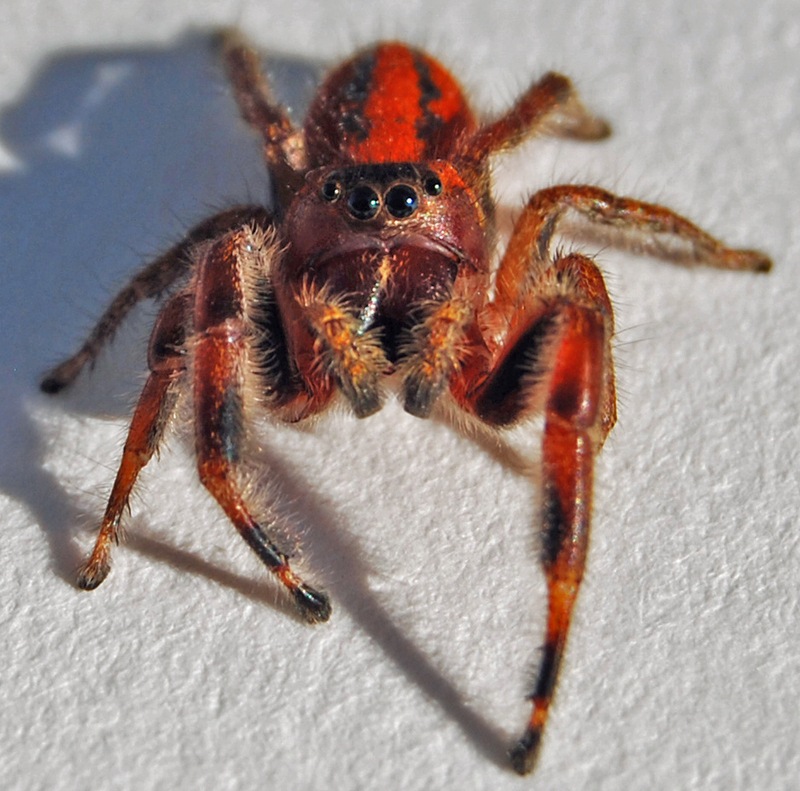 McCook’s jumper (Phidippus mccooki) is another name for the cardinal jumper (Phidippus cardinalis). The arachnological community presently agrees that Phidippus mccooki is no more than a synonym for Phidippus cardinalis. Note that the photographs posted on this page, as with all the photos posted on bugsinthenews.info, can be enlarged for more detailed viewing by placing your cursor over them and left-clicking. 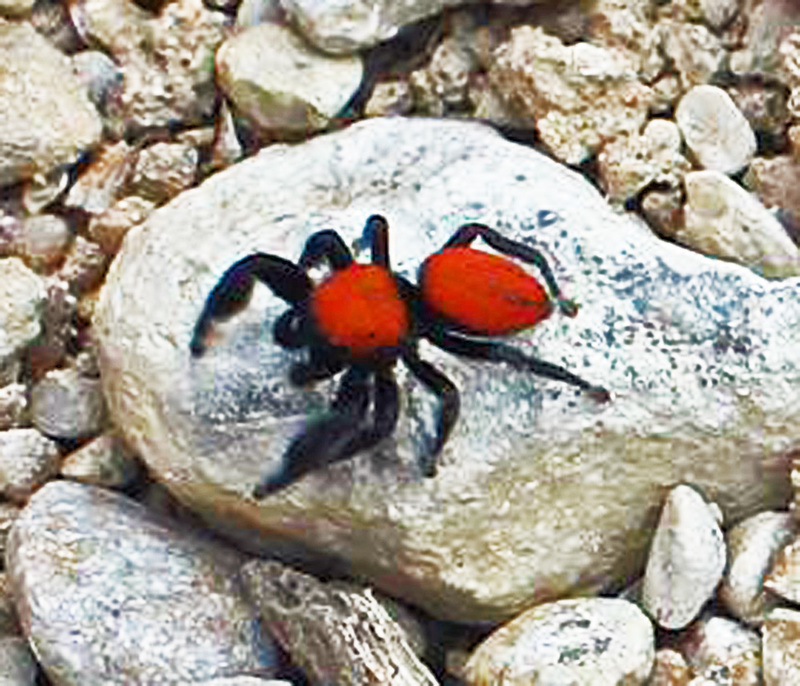 The cardinal jumper differs from the Johnson jumper (Phidippus johnsoni), in that both males and females of the cardinal jumper have, instead of the black carapaces of the Johnson jumper, red ones. 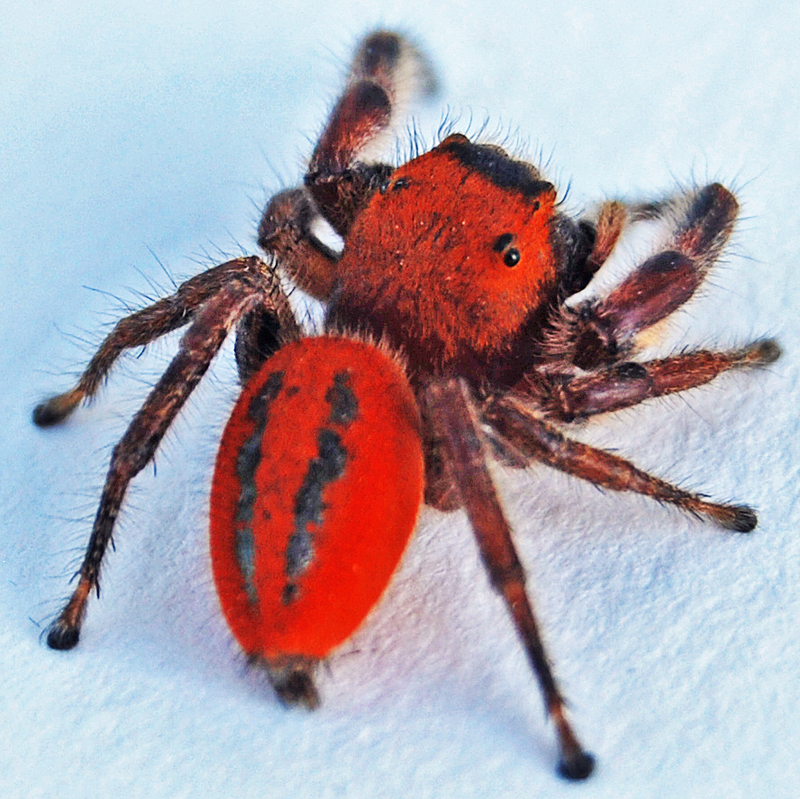 But that is not unique within the genus Phidippus, as another species (P. whitmani) is also red, or marked with red, on both carapace and dorsal abdomen. The synonym, McCook’s jumper, was thought to denote a unique species distinguished by having two prominent, dark, longitudinally oriented, lateral stripes (or bands) on the dorsal abdomen, subdivided along their lengths into at least three somewhat distinct sections. Accordingly, the cardinal jumper was thought to differ from McCook’s jumper by, although having these same bands, displaying them in a form that was much subdued by comparison, particularly in the male; in the female the bands were subdivided by white spots embedded linearly within them, whereas these white spots were absent in the female McCook’s jumper. Today it is recognized that these are simply variations exhibited by different specimens of the cardinal jumper. The photo at left is of a specimen photographed near the city of West, Texas (which despite its name [which derives from the surname of the city’s first postmaster], is located in Central Texas, north of Waco), in October of 2010. Notice that the dorsal abdomen has faint markings where, in the photos taken by Mr. Stewart in North Zulch, Texas, in August of that year, the markings are dark and quite distinct. 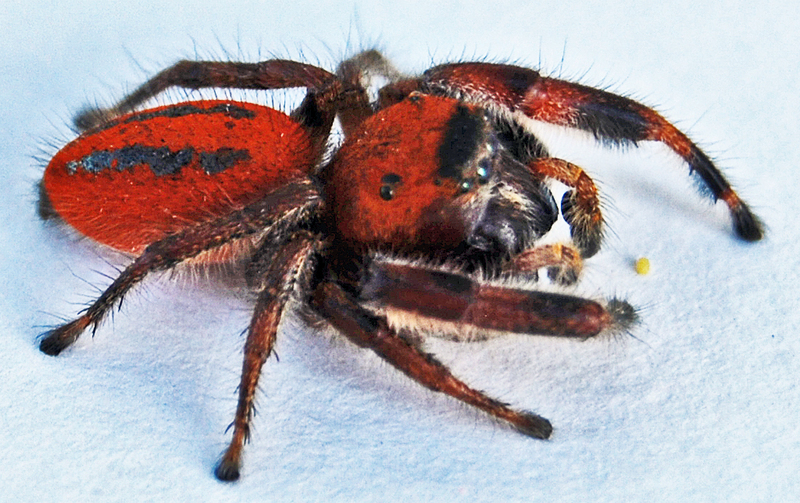 Both spiders, however, are likely of the same species, P. cardinalis. Before proceeding further, it would be remiss to be silent about the location (North Zulch, Texas) where this spider was found. The history of that little village began in the late 1840’s–only a few years after Texas declared its independence from Mexico. It was here that a young itinerant merchant named Julias Zulch, who had immigrated to Texas from Kassel, Germany, took a chance and built a modest log house and general store on the trail connecting Booneville and Midway. The spot, which travelers knew as “willow hole,” had a good spring that produced drinking water throughout the year, and willow trees that gave shade in the hot summertime. It had, for obvious reasons, been used by travelers for years as an overnight campground, and Zulch figured that, what with the faithful spring and shade trees, he’d have a constant flow of paying customers who needed his supplies to continue their sojourns abroad. It is no surprise that Mr. Zulch, who watched his pennies carefully and made sure his wares met the needs of his clients, prospered. Notice in the photo at left that Mr. Stewart’s spider has a “Groucho Marx” eyebrow above the anterior eye row. The first leg is fringed with brown or black, but also with a considerable amount of what could be described as white fringe in evidence; this is characteristic of the cardinal jumper, and varies in sometimes having white or black fringes. The posterior median eye (PME) is the small black spot just below and slightly behind this eyebrow. Pay particular attention now to the pedipalps. They show, in this photo, as having swollen distal extremities (the cymbium or tarsus) with complicated structures on their ventral aspects. That is, on their dorsal (leading) surfaces, they appear as ordinary palpal appendages, but on the ventral (trailing) surface–in the enlarged photo of the lefthand pedipalp–can be seen a darkened protrusion that is separate from, but attached to, the tarsus. This structure appears to be consistent with the 1883/1909 drawings made by the Peckhams of the P. mccooki male embolus, as presently published by Jerzy Proszynski. Back to Julius Zulch: he bought up the surrounding land with his profits and became a productive cotton grower. Then, in the 1870’s, running short of labor, he advertised for new immigrants from Germany, lending them money for passage to Texas, so they could help with his enterprises. Many of these immigrants came from the German province of Posen. They took up residence near the village ofwhat was then known as Willow Hole, where they farmed as tenants on Zulch’s land, and saved their pennies until they, too, could purchase land to farm. Willow Hole was renamed Zulch, in 1906, to honor the man whose gamble in 1850 had led to its creation. But–as luck would have it–in that same year the Houston and Texas Central Railroad directed its new Navasota-Mexia branch line so that it bypassed the city, which bade none too well for the latter’s future. Worse, in the very next year, the Trinity and Brazos Valley Railway built its Iola-Normangee spur along the new Navasota-Mexia right of way, and by then the inhabitants of Zulch could see the writing on the wall. 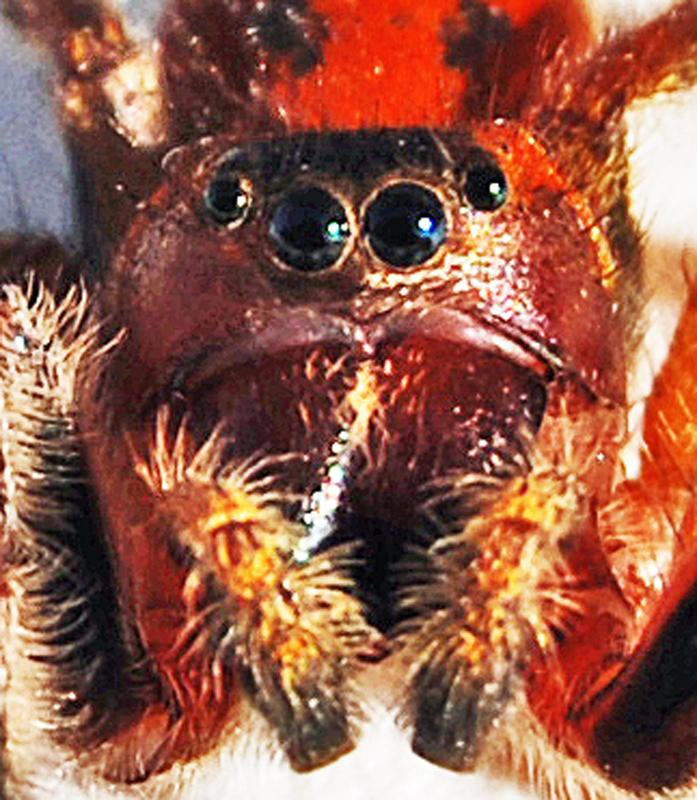 Take a good look at the face of this spider. 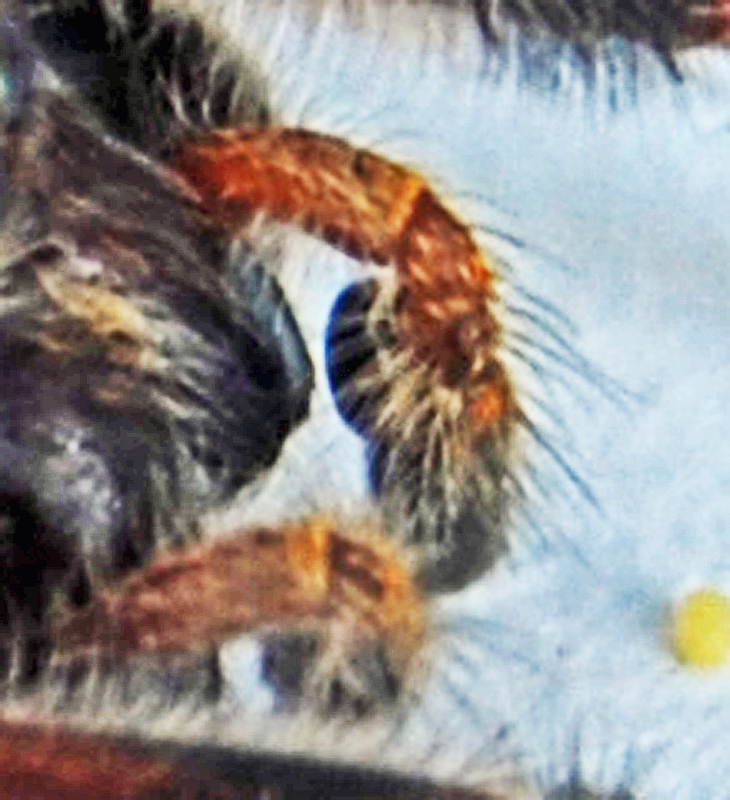 The arrangement of the eyes is clearly consistent with the genus Phidippus. Eyebrow tufts are present, too, though subdued in comparison with, say, the bold jumper, Phidippus audax. Note also that the hairs on the front leg are no brighter a shade of white than those on the rest of the body. One could call them “brown” instead of “white”, even without considering the fact that the image has been processed to bring out subtle contrasts. As with other photos posted here, the originals were rather dark. The lightest hairs seen here are much darker in the unprocessed image. Brown, indeed, is the right descriptor. Back to the residents of Zulch, Texas, in the year 1907: Seeing the way things were moving, they accordingly moved north two miles, to where the rail lines were. It was the right thing to do, of course. Zulch declined as a result, but North Zulch, which was the name most used for the clutch of homes that sprang up “astraddle the tracks” at the new location, increased. — BugsInTheNews is a VIEWER-PARTICIPANT WEBSITE. Questions? Corrections? Comments? BUG ME RIGHT NOW! Telephone 512-331-1111. E-mail jerry.cates@bugsinthenews.info. Or register, log in, and leave a detailed comment in the space provided below. It was on my Shed after a nice rain. I’d never seen one before anywhere.